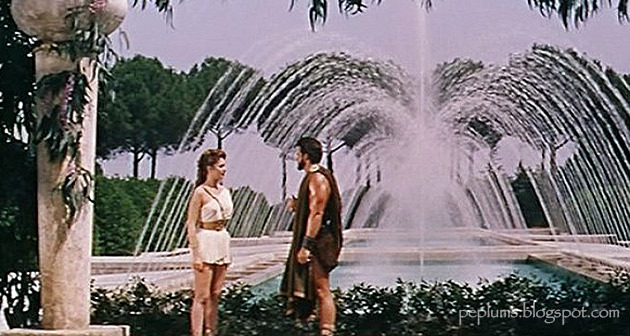 Behind-the-scenes photo (below) shows the crew of HERCULES (1958) taking a photo, with Sylva Koscina, director Pietro Francisci and Steve Reeves. The photo above is basically how the scene looks like in the finished film. What's interesting about the BTS photo is the location, Salone delle Fontane (link), and from looking at the photo they cleverly left out the big buildings on the sides from the entire sequence.